Schmincke has been developing and manufacturing its Horadam line of watercolors since 1881, and the company is now owned by the fourth generation of the original family. Schmincke has a reputation for using only the highest-quality natural gums, water-soluble resins, and pigments. Full Pan Set of 12 Colors — Contains full pans in 12 colors, including Lemon Yellow, Cadmium Yellow Light, Cadmium Red Light, Permanent Carmine, Ultramarine Finest, Prussian Blue, Phthalo Green, Permanent Green Olive, Yellow Ochre, English Venetian Red, Sepia Brown, and Ivory Black. 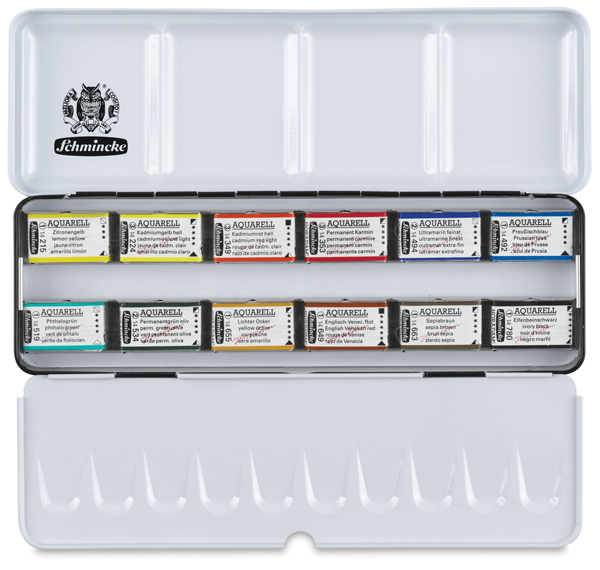 Full Pan Set of 18 Colors — Contains full pans in 18 colors, including Lemon Yellow, Cadmium Yellow Light, Cadmium Red Light, Permanent Carmine, Ultramarine Finest, Prussian Blue, Phthalo Green, Permanent Green Olive, Yellow Ochre, English Venetian Red, Sepia Brown, Ivory Black, Chrome Orange, Cobalt Green Dark, Naples Yellow, Burnt Sienna, Manganese Violet, and Cerulean Blue Tone. 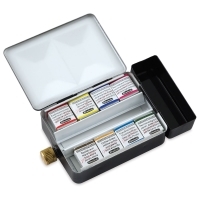 Full Pan Set of 24 Colors — Contains full pans in 24 colors, including Lemon Yellow, Cadmium Yellow Light, Cadmium Red Light, Permanent Carmine, Ultramarine Finest, Prussian Blue, Phthalo Green, Permanent Green Olive, Yellow Ochre, English Venetian Red, Sepia Brown, Ivory Black, Chrome Orange, Cobalt Green Dark, Naples Yellow, Burnt Sienna, Manganese Violet, Cerulean Blue Tone, Chrome Yellow Deep, Deep Red, Magenta, Indigo, Helio Turquoise, and May Green. Half Pan Set of 24 Colors — Contains half pans in 24 colors, including Lemon Yellow, Cadmium Yellow Light, Cadmium Red Light, Permanent Carmine, Ultramarine Finest, Prussian Blue, Phthalo Green, Permanent Green Olive, Yellow Ochre, English Venetian Red, Sepia Brown, Ivory Black, Chrome Orange, Cobalt Green Dark, Naples Yellow, Burnt Sienna, Manganese Violet, Cerulean Blue Tone, Chrome Yellow Deep, Deep Red, Magenta, Indigo, Helio Turquoise, and May Green. Half Pan Set of 36 Colors — Contains half pans in 36 colors, including Lemon Yellow, Cadmium Yellow Light, Cadmium Red Light, Permanent Carmine, Ultramarine Finest, Prussian Blue, Phthalo Green, Permanent Green Olive, Yellow Ochre, English Venetian Red, Sepia Brown, Ivory Black, Chrome Orange, Cobalt Green Dark, Naples Yellow, Burnt Sienna, Manganese Violet, Cerulean Blue Tone, Chrome Yellow Deep, Deep Red, Magenta, Indigo, Helio Turquoise, May Green, Translucent Yellow, Translucent Orange, Scarlet Red, Ultramarine Violet, Delft Blue, Mountain Blue, Prussian Green, Olive Green Yellowish, Brilliant Yellow Dark, Madder Brown, Indian Red, and Burnt Umber. Half Pan Set of 48 Colors — Contains half pans in 48 colors, including Lemon Yellow, Cadmium Yellow Light, Cadmium Red Light, Permanent Carmine, Ultramarine Finest, Prussian Blue, Phthalo Green, Permanent Green Olive, Yellow Ochre, English Venetian Red, Sepia Brown, Ivory Black, Chrome Orange, Cobalt Green Dark, Naples Yellow, Burnt Sienna, Manganese Violet, Cerulean Blue Tone, Chrome Yellow Deep, Deep Red, Magenta, Indigo, Helio Turquoise, May Green, Translucent Yellow, Translucent Orange, Scarlet Red, Ultramarine Violet, Delft Blue, Mountain Blue, Prussian Green, Olive Green Yellowish, Brilliant Yellow Dark, Madder Brown, Indian Red, Burnt Umber, Titanium Opaque White, Permanent Chinese White, Indian Yellow, Naples Yellow Reddish, Madder Red Dark, Phthalo Blue, Cobalt Turquoise, Neutral Tint, Payne's Gray Bluish, Gold, and Silver. Also includes a half pan of ONETZ oxgall medium. Half Pan Set of 8 in Metal Travel Box — Be ready whenever and wherever inspiration strikes! Pour water from the built-in flask into the removable water container and you're ready to paint. The durable, compact travel palette comes with eight half pans. Colors include Cadmium Red Light, Lemon Yellow, Permanent Carmine, Permanent Green Olive, Prussian Blue, Sepia Brown, Ultramarine Finest, and Yellow Ochre. The space in the middle of the palette can hold four additional half pans or a travel brush (not included). Schmincke is the only watercolor manufacturer in the world that uses the exact same formula for their tube and pan colors. Other manufacturers extrude their pan colors. Schmincke hand pours the same watercolor paint that is in their tubes into convenient pans. Then the pans are left to air dry. This process is repeated three more times. The pan colors are consistent all the way to the bottom, and they last and last!